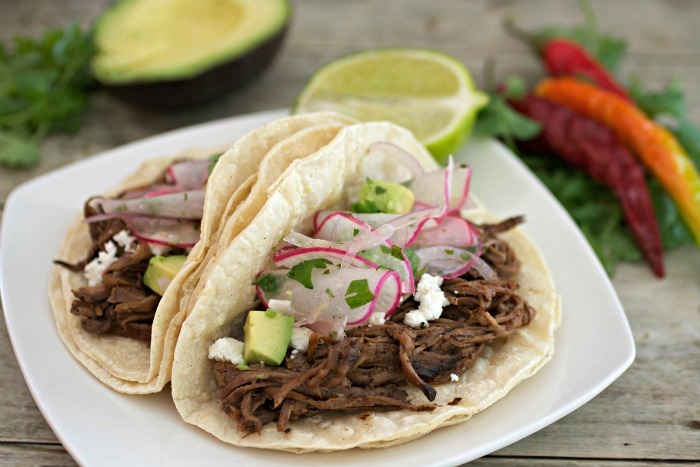 Place the beef chuck roast in the bottom of a slow cooker. Cover with the Cholula, chili powder, garlic powder, onion powder, dried cumin, dried oregano, salt, pepper, and lime juice. Cover and cook on low for 8 hours or on high for 5 hours. When roast is finished cooking, remove from the liquid & set aside. Skim fat off top of remaining beef liquid and discard. Shred beef with two forks & place back in liquid. Stir well, taste & add salt if needed. Keep warm. Combine the sliced radishes and all other ingredients in a medium sized bowl. Stir well, cover and place in the refrigerator until ready to use. 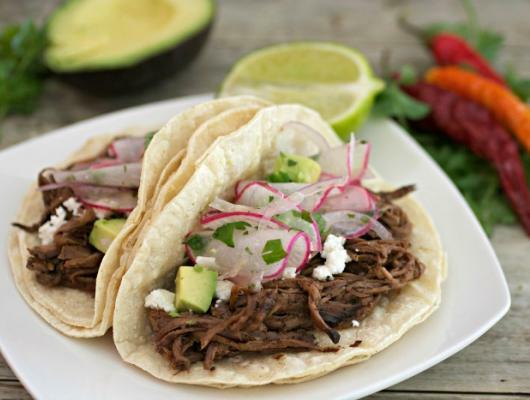 To serve, stack 2 warmed corn tortillas on top of each other, fill with desired amount of shredded beef and top with radish salad, Cotija cheese, diced avocados, and extra Cholula.